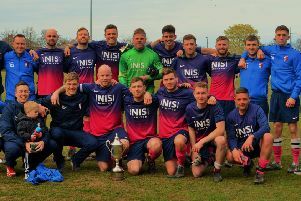 Wallington’s affinity with cup finals stretched to a fourth year on Saturday as they overcame Walker Central in a penalty shoot-out. Tom Truscott scored the winning penalty after Matty Lees had saved three for The Greens to seal a place in the FA Benevolent Bowl showpiece at Whitley Park, likely to be played sometime in April. This continues a remarkable run for the outfit from Scots Gap because they have now reached four separate cup finals in as many years. The achievement is even more impressive as it has come during what was being billed as a transitional season following a summer of upheaval. Long-standing manager Steve Cowan, as well as influential players Trevor Baston, Jordan Nellis and Sam Walton, all departed, leaving new manager Davey Featherstone to rebuild a squad that was looking frail towards the back end of last year. However, with this final now in the bag and a chance to push up into the higher echelons of the Premier Division, the road is looking brighter once again. The visitors took the lead just before the half-hour mark. After withstanding an early siege from their opponents, a quick free-kick involving Ben Fenwick and Josh Gilmartin saw the latter deliver a cross that a hapless defender could only divert into his own goal following pressure from John Paxton (0-1). Lees had to be on hand to deny one point-blank header as Walker mounted an immediate response, but the players in front of him continued to stand tall. This story continued into the second period as the home side poured forward in search of an equaliser. Justin Millican, Nick McClughin, Alex Slack and Kyle Reardon were all required to make crucial interventions and when they weren’t, Walker were helping them out themselves. Their best move of the game resulted in Lees instinctively palming away a point-blank header before the rebound was blazed over with the goal gaping. Soon afterwards, a similar chance arose, only this time the header was diverted wide. As the clock ticked down, some much-needed fresh legs were introduced in the shape of Adam Whitehead and Truscott – they replaced Matty Blackith and Liam Anderson respectively. With the hosts beginning to throw more caution to the wind, Wallington were seizing the extra space, if not the initiative. Reardon struck wide when well-placed and then Paxton shot straight at the keeper when his pace afforded him a golden opportunity to seal the tie. A second goal would have almost certainly killed off a spirited Walker, but they were buoyed by their opponents’ own failure in front of goal and duly got their reward when their own substitute finally snaked through The Greens’ backline to score (1-1). As both sides were limited in their recent game time, heavy legs took centre stage during extra-time. Captain Slack had run himself into the ground and was replaced by Simon Brown for his first appearance since breaking his leg back in August. A flurry of half-chances and set-pieces was the best either side could muster as the tie slowly ebbed towards the inevitable shoot-out. Fenwick took advantage of Lees’ opening save to give Wallington the lead before he kept out the second one, only for the linesman to penalise him for encroaching. Walker converted the retake and when Gilmartin saw his effort saved it was back to square one. A third save from Lees preceded Brown’s effort off the crossbar before his defensive counterpart blazed the home side’s fourth penalty over the bar. Chris Moffitt confidently stroked home to give the away side the advantage and when Walker’s keeper found the net with his own penalty, it was left to Truscott to send The Greens to the final.